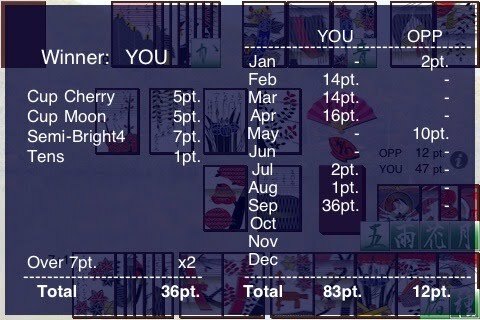 You can enjoy "Koi-koi" rule of Hanafuda. There are 3 modes in Koi-koi 1 Player mode. The 12 Months mode is a orthodox mode of Koi-koi rule, however, this 6 Months mode is a half of that. One game consists of 6 months hands, Win or Lose depends on total points of those hands. The 12 Months mode is a orthodox mode of Koi-koi rule. One game consists of 12 months hands, Win or Lose depends on total points of those hands. The Knockout is a Koi-koi based this HANAFUDA Japan's original game, one of "1 Player" mode. 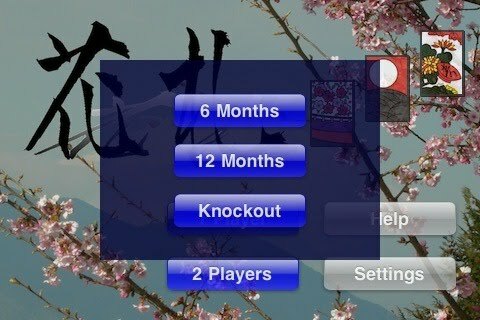 This mode is different from "6 Months" or "12 Months", knockout competition through months(hands). If you win a hand you gain points and simultaneously your opponent(OPP) reduces his points and vice versa. If you make your opponent 0pt. in the month, you win the month and you can go to next month. When your points become 0pt., the game is over. 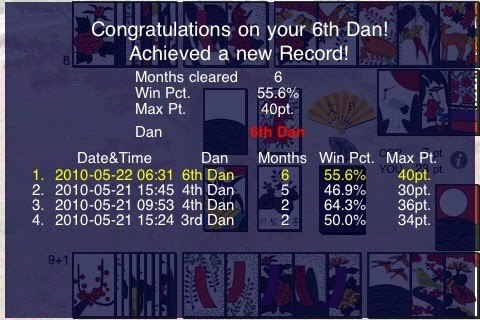 Finally, you get your Hanafuda's Dan(段, means levels in Japan) based on your cleared months count, your winning percentage and your max points in one hand. So, please enjoy and challenge!